Here's the thing about Hahamongna: the place is unique. Just over the city's edge and at the mouth of the Arroyo Seco, Hahamongna is a rare spot that lies between the San Gabriel Mountains and the expansive urban flatlands. There's a stream, native plant life, animals and birds. Nothing like it in Pasadena. Really not much like it in all of southern California. Soccer fields, are important. But, soccer fields do not need to be built in Hahamongna. So, what's with the map? We don't generally think much about the natural landscape of our cities. That's probably because we don't see much of it any more. Hills have been graded down, low spots filled up, ravines covered, buildings erected. But, there is or was a natural terrain around us. 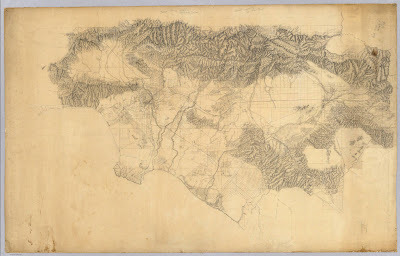 The map shows this in detail -- the dominant San Gabriel Mountains, the smaller ranges, the valleys, and near the middle of the map, two rivers running from the mountains to the ocean. You can spot where Pasadena is -- in the upside down "u" just east of the big San Fernando Valley. Aside from the fact that old maps are fun, the point is this: The valleys are expansive. But over the entire region, there are few places where river, valley and mountains converge. Hahamongna is one of those places. Let's preserve it. Terrific post, Michael, and I loved the map. And you should also receive credit: this blog day was your idea in the first place. Just knew yours would include lovely history and geography. "We don't generally think much about the natural landscape of our cities. That's probably because we don't see much of it any more. Hills have been graded down, low spots filled up, ravines covered, buildings erected." Love the map, love the sense of space and the map is lovely. All of this reinforces the unique place that is the arroyo. Thanks for starting this effort. I'm guessing there's a good possibility that on Monday night the city council will consider a change to the master plan provisions related to soccer fields. I love old maps...along with old photos they are as close as we can get to a time machine to see things as they once were. Thing thing about Hahamonga is that it is one of very few places left that actually still exists much as it once was. I hope that we manage to keep it as is.